The Dolphin Stadium is the highlight of the uShaka Sea World experience for many visitors. In addition to providing visitors with a unique opportunity to see these magnificent animals, the dolphin presentation gives visitors a glimpse into natural dolphin behaviour and an opportunity to learn more about these amazing animals at close quarters, an opportunity that is seldom possible for most people, even those privileged enough to go to sea. Dolphins are mammals, and suckle their live-born young. The dolphin’s streamlined body is propelled by up and down beats of the powerful tail flukes. In addition to acute hearing, keen eyesight and a well-developed sense of taste and touch, dolphins have an extraordinary sense known as echo-location. This specialised sonar system enables dolphins to detect their food and avoid predators. The care and well-being of each dolphin is of prime importance. Meticulous daily records are kept detailing feeding, general condition and behaviour. 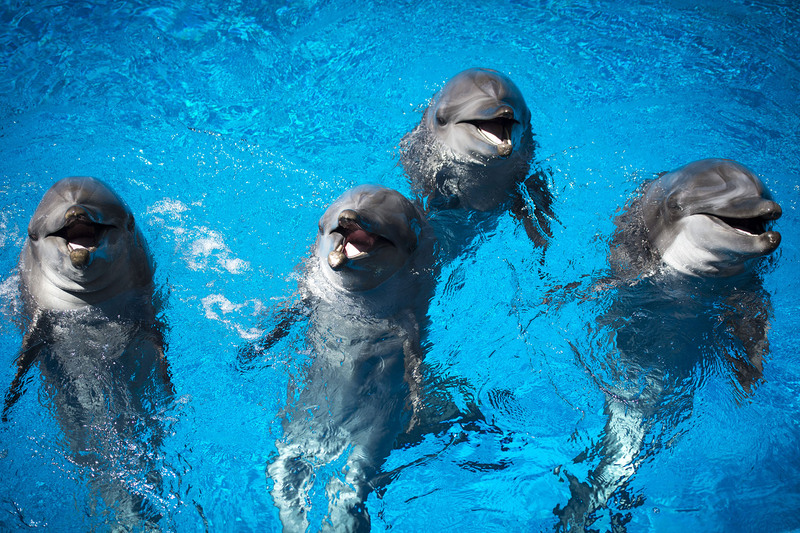 The dolphins at uShaka Sea World consume approximately 6% of their body weight daily. Each day, hake, sardines and squid are carefully defrosted and weighed out for each dolphin in their own food preparation kitchen. A well-equipped laboratory and medical centre enables us to provide each animal with optimal health care. The newly developed Dolphin Lookout area allows visitors to view dolphins during training sessions or socialising and playing with their enrichment items.